To plastic beaker, add 2.20 oz. cut up clear soap base and add 0.20 oz. blue color bar. Heat in microwave until just melted. Add 4 micro scoops of super sparkle glitter and stir. 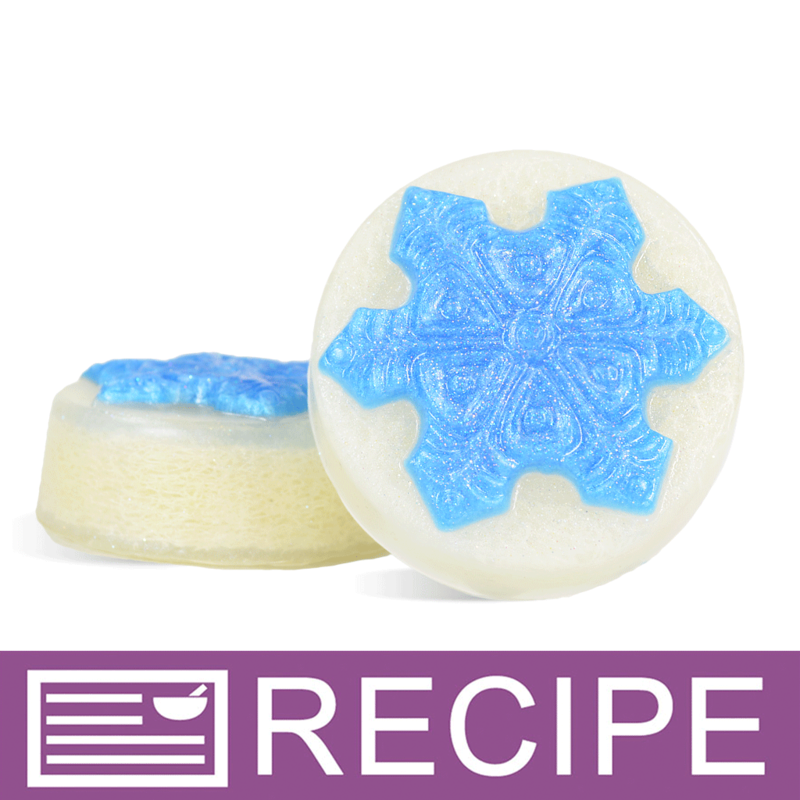 Pour into snowflake area of the 6 soap cavities. Spritz after pouring to remove air bubbles. Let harden. To microwave-safe measuring cup, add 26 oz. cut up clear soap and 0.20 oz. white color bar. Heat in microwave until just melted. Add 6 micro scoops of super sparkle glitter and 0.80 oz. fragrance oil and stir. Spritz snowflake in each cavity with rubbing alcohol. Place a luffa slice into each cavity and fill halfway with soap. If luffa starts to rise, hold down until soap starts to set up. Spritz again and fill cavities with soap until it reaches the top. Spritz and let harden. Remove from molds. 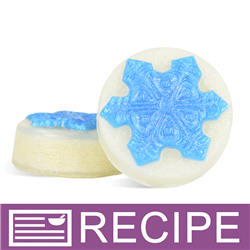 If soap is difficult to remove, place in freezer for 30 minutes. Unmold and wrap in plastic wrap or other airtight packaging. Place one bar into cello bag and tie with coordinating ribbons. To Use: Lather onto wet skin and rinse with warm water. Keep out of eyes. Ingredient Label: Sorbitol, Propylene Glycol, Sodium Laureth Sulfate, Stearic Acid, Lauric Acid, Water, Sodium Hydroxide, Glycerin, Fragrance, Titanium Dioxide, Ultramarine Blue, Synthetic Fluorphlogopite, Titanium Oxide, Polyethylene Terephthalate, Acrylates Copolymer.